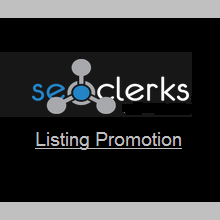 Need a bit of extra promotion for your own listing at SEOclerks? I have a PR 2 SEO/MMO blog with an SEO clerks affiliate store page and I will place a specific link of your sales page image to your service url in the top 5 (now 3) and keep it there for 30 days (1 month). The page gets over 100 views every day and your listing will always stay above the rest and never drop below number five during the duration of your time. NOTE: Only 3 slots are now available and I will place "Sold Out" on this listing page when they are all gone until the following month.